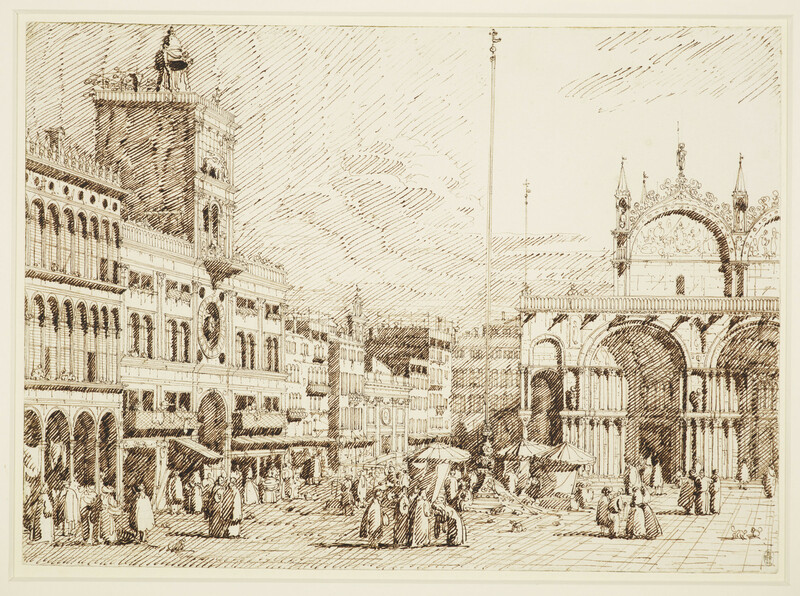 A drawing of a view in Piazza San Marco in Venice. On the left is part of the Procuratie Vecchie, and the Torre dell'Orologio - a large clock tower containing an astrological clock. On the right is part of the Basilica di San Marco. Many figures are depicted in the piazza. The Torre dell’Orologio (clock-tower), at the eastern end of the northern range of Piazza San Marco, was built to the designs of Mauro Codussi in 1496-9 to house an astronomical clock constructed by Gianpaolo and Giancarlo Ranieri. The clock-face shows the hours of the day and the movements of the sun and moon through the zodiac; above the clock-face are doors from which, each hour, figures of the Magi emerge to bow before a statue of the Madonna in the central niche. On top of the tower is a bell struck on the hour by two monumental bronze Moors. Canaletto has taken a long view of this corner of the Piazza, foreshortening the buildings to the left, including the eastern end of the Procuratie Vecchie. He eliminated the northern dome of San Marco, and as in another drawing he altered the proportions of the façade, enlarging the upper lunettes and diminishing even further the pinnacles between them. The drawing was constructed in two stages, a crisp outline with a narrow pen, followed by dense diagonal hatching with dark ink and a broad nib, obscuring much detail in the entrance bays of San Marco and in the shops of the north range. The view of San Marco served as the basis for a capriccio (RL 7432), where it is found transcribed almost exactly. The composition corresponds generally to a painting in Ottawa.